(CNN) -- NASA officials have postponed the landing of space shuttle Atlantis until Saturday because of weather concerns. Atlantis launched May 11 for NASA's final repair visit to the Hubble Space Telescope. The first opportunity to land the shuttle at Florida's Kennedy Space Center will be at 9:16 a.m. ET Saturday, NASA said on its Web site. NASA canceled two possible landing times Friday morning because of a weather system that has dumped more than 2 feet of rain over parts of northeastern Florida. That weather system is lingering in the Gulf of Mexico and continues to spread rain across the region. If the weather continues to cause problems Saturday, the shuttle could land at Edwards Air Force Base in California. The space agency listed five potential landing times for Saturday. NASA also listed six potential landing times on Sunday for Edwards, Kennedy and White Sands Space Harbor in New Mexico. Atlantis launched May 11 for NASA's final repair visit to the Hubble Space Telescope. Atlantis astronauts conducted spacewalks during the mission to perform routine repairs and replace key instruments. The mission was one of the most ambitious space repair efforts ever attempted. 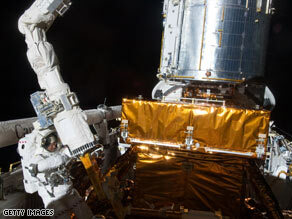 Hubble was released back into solo orbit Tuesday morning. In space for 19 years, Hubble can capture clear images that telescopes on Earth cannot, partly because it does not have to gaze through Earth's murky atmosphere.